BLUE RIDGE, Ga.-A police chase ended with the detainment of the suspect involved. The Fannin County Sheriff’s Office made the arrest after becoming involved in the chase shortly after midnight on Wednesday, Jan. 10. 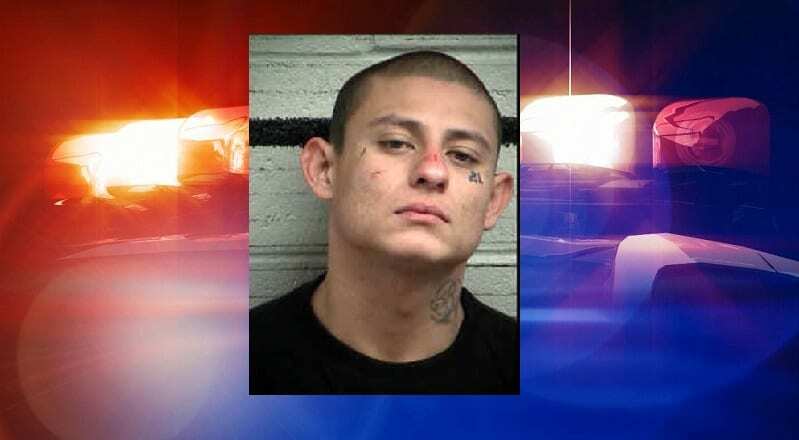 Edmundo Ramirez was apprehended after a police chase in Fannin County. Fannin County Sheriff Deputy Jared Wood noticed a green Nissan Pathfinder traveling South on Ga 2 with a brake light out and failing to maintain its lane. Initially the Pathfinder pulled over, coming to a stop, when Wood signaled for the driver to do so. After pulling over the vehicle then sped off to avoid the traffic stop. Several illegal traffic maneuvers later, the Pathfinder turned on to Old Hwy. 76 and proceeded towards downtown Blue Ridge. Blue Ridge City Police Department was made aware of the situation and attempted to deploy spike strips at the Orvin Lance Connector and Old Hwy. 76. The driver, identified as Edmundo Ramirez, eluded this attempt and continued closer to the downtown area. After turning off of East First Street, the Pathfinder was then observed running the stop sign at the intersection of East Main Street and Mountain Street. 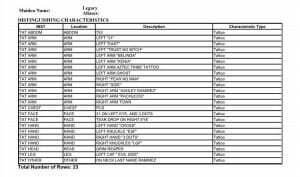 Ramirez continued traveling down East Main Street going the wrong way on a One Way designated section and maintaining a speed of approximately 50-55 m.p.h. After reaching the end of East Main Street, the vehicle turned right onto Old Hwy. 76 in the direction of Ga 2 once again. Ramirez lost control of the Pathfinder before reaching Ga 2, and struck a natural rock formation, leading to a crash that would disable the vehicle in front of Bill Holt Chevrolet. Upon wrecking the vehicle Ramirez attempted to flee, but quickly surrendered when Deputy Wood, conducting the scene as a felony traffic stop, pulled his handgun and demanded the suspect to halt. Ramirez then put his hands in the air and lay face down on the ground. Edmundo Ramirez, age 25 of Buford, Ga., was arrested and charged with multiple traffic misdemeanors. These misdemeanors include reckless driving, driving on the wrong side of the road, failure to stop at a stop sign, failure to obey traffic devices or police, failure to wear a seat belt, and failure to maintain lane. Along with these traffic misdemeanors, Ramirez is being charged with driving on a suspended or revoked license and felony fleeing or attempting to elude a police officer. Ramirez, who has a criminal history throughout the state of Georgia, was detained for similar charges in Buford. He currently has an outstanding criminal warrant in Hall County. 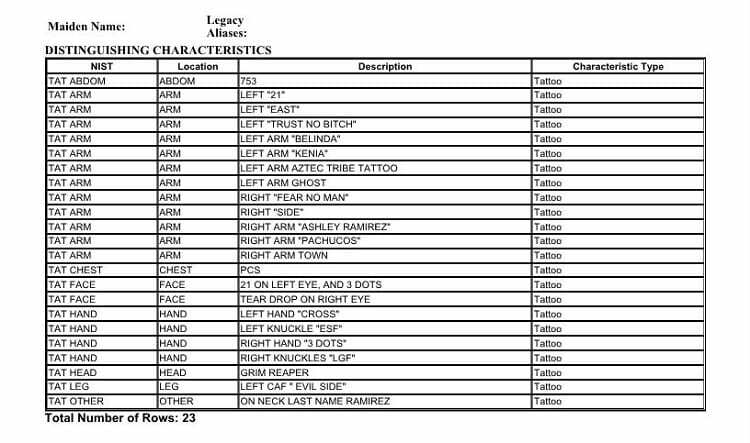 A list of distinctive markings from Ramirez’s booking sheet. 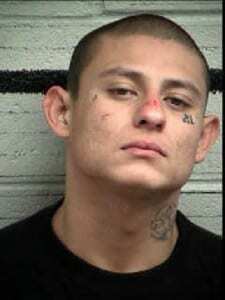 As indicated by the tattoos covering his body, Ramirez also has confirmed ties with the violent street and prison gang, the Barrio Aztecas. The Barrio Aztecas formed in the late 1980s in El Paso, Texas, and quickly grew to become an international crime group with strong ties to the Juarez Cartel in Mexico. Known for drug trafficking and contract killing, the Barrio Aztecas are considered one of the most dangerous gangs in America. Barrio Azteca Captain Eduardo Ravelo is currently on the the FBI’s Ten Most Wanted Fugitive list. Fannin County Sheriff Dane Kirby was unable to comment on the detainee’s affiliations. A source with the Appalachian Drug Task Force spoke with FetchYourNews about gang related activity in North Georgia. Ramirez made an initial appearance in court on Wednesday, Jan. 10. Magistrate Judge Brian Jones set bond at $12,500 for the charges in Fannin County. Ramirez is currently being held at the Fannin County Jail. A hold has been placed on the detainee for transfer to Hall County, Georgia where Ramirez has an outstanding criminal warrant. Next Article » Short Takes - Fire and Fury, Don't Look for a Pulitzer!